This Santa Claus craft is made to look like the jolly holiday icon himself. 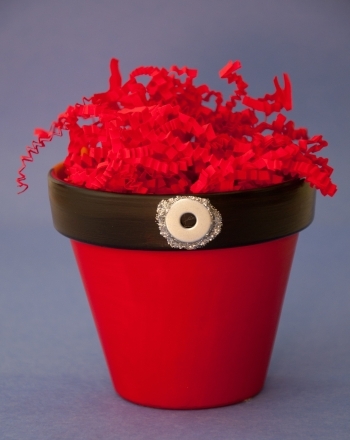 This clever Santa Claus craft is made to look like the holiday figure with a red suit! Reminiscent of the classic Christmas figure without going over the top, this is the perfect activity for older kids who still love cuteness and candy. 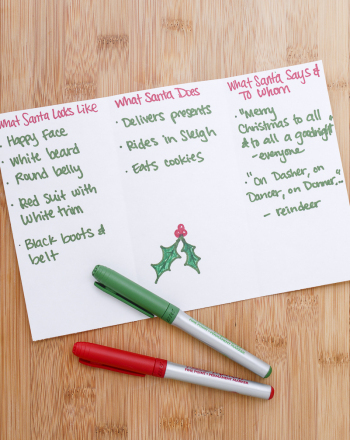 Make a Santa Claus craft with your child this holiday season. Help your child set up her workspace by layering a few sheets of newspaper over a table. Allow paint to completely dry before moving forward. Let her carefully run a line of paper tape just under the lip of the terra cotta pot. This will help prevent the black paint from getting onto the rest of the pot. Have your child paint the rim of the pot black. Help her remove the paper tape as gently as she can. If she yanks the tape off, some of the red paint might rip up as well. Let her glue a silver washer on the black "belt." Have her draw a line of silver glitter glue around the washer to create a little holiday sparkle. 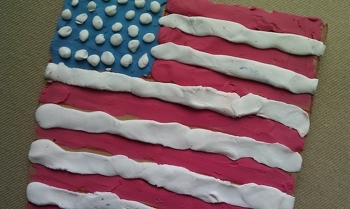 Line the inside of the pot with tissue paper and candy! She now has a delightful treat holder to keep for herself or to give away as a present. 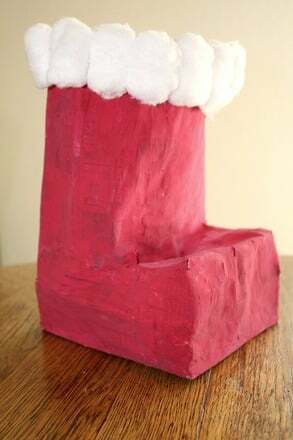 Craft a durable, three-dimensional Santa boot that looks great as a stocking, gift box, holiday decoration, or table centerpiece. Looks like Santa Claus is in trouble! It's up to your creative writer to unravel the mystery behind this mysterious letter. As he colors this picture, your child can come up with adjectives to describe Santa. Learn about Santa Clara with this fun worksheet, which includes a timeline, word search, trivia question, and a coloring activity. Color in Santa, cut his parts out, and attach them together to create a puppet full of good cheer! This Star of David craft is eco-friendly and will help your child practice basic geometry. Make a festive Star of David craft for Hanukkah. 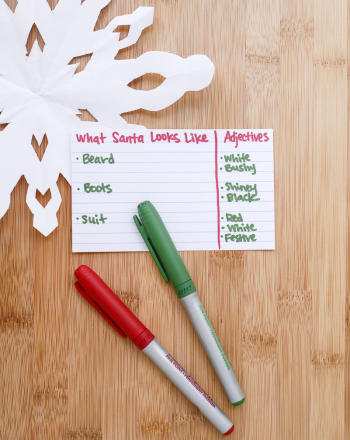 Start with adjectives and have your child describe Santa Claus to someone who has never heard of him.